The newest edition to the Daymak line is the Daymak Rogue! 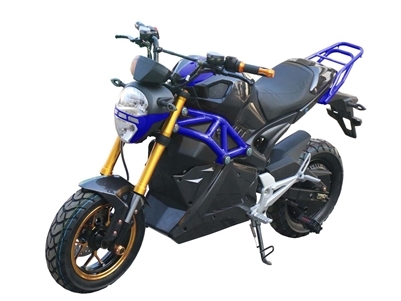 Reminiscent of the Ducati Monster this fully electric scooter is the perfect way to travel intercity. From its stylish gold plated USD front shocks to its red grid iron accents, it truly glorifies the modernization of the ebike. 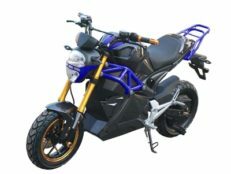 This 72V electric scooter comes with a Bluetooth controller to allow you to adjust you acceleration, lock the motor increase the range and much more. The slightly larger seat height allows for riders of all sizes to comfortably ride. With a very large locking glove compartment to store 1021 cubic inches, easily store your charger and your personal goods and more. Other features include cruise control, 3 speed switch turn signals and brake lights. All of these features and without a license or insurance required. Get on the road with the 2017 Daymak Rogue the next generation of ebikes.